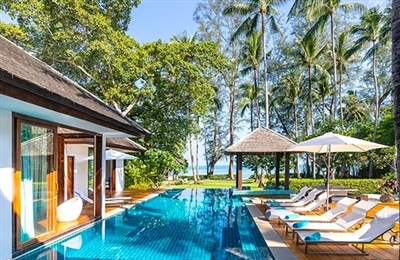 We particularly enjoyed the sense of space at the Tawantok Beach Villas created by the open walkways, skylights and uncluttered décor. Big groups won’t feel as though they’re on top of each other as there’s more than enough space between the lounge area, abundant pool loungers, the dining sala, and the master suite’s own private lounge. We experienced the villa as a family. The staff were most accommodating, and it’s obvious they love having children as guests. We enjoyed the villa’s outdoor activities including a paddle in the kayaks and a game of volleyball on the beach (there’s a net set up). 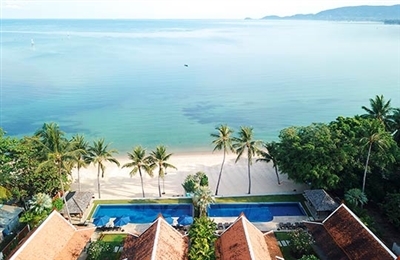 The tennis court is private, shared only with neighbouring Tawantok Beach Villa 2, which means that’s there’s no long waiting list to play, and the staff can even arrange a tennis coach (advance notice required). We had a long walk on the beach to build up an appetite before dinner, and this highlighted the villa’s ideal location for those seeking peace and tranquillity, but without being completely isolated. The beach is clean, and as we walked along we passed local children swimming and playing in the sand, fishermen setting out their nets and even a sunset wedding – very popular on Lipa Noi Beach. There aren’t any troublesome beach vendors along here, but there are a few resorts and restaurants if you want to stop for a drink along the way. Even better, enjoy sun-downers, as we did, lounging by the villa pool, taking in Lipa Noi’s famous sunset. We chose our dinner from the villa’s suggestion menu and enjoyed both Thai and Western dishes – salad, pasta and a vegetarian red curry, followed by a fresh fruit platter. What a treat to come back to a perfectly prepared meal after a long walk and a sunset swim!